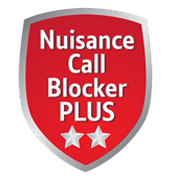 The BT 6510 features some of the best Nuisance Call Blocking technology. This amazing technology offers users excelent control over which calls they want to allow. You can are able to block a list individual numbers. Additionally you are able to block calls by their type. Examples include witheld or international So long as you add your contacts to your phone, they can bypass the call blocking, so you don't miss them all important calls from friends or relatives. The BT 6510 is very easy to set up thanks to the set up wizard allowing you to be making calls straight as quick as possible. The new screen design makes using features like call waiting, three way calling and call divert easy to use. The type II caller display will show the number calling, if that number matches a number within your saved phonebook their name will appear when the number calls. A built in answer machine with 30 minutes recording time means that you can go away and be reassured that all messages will be saved. You can even use the remote access feature that allows you to check your messages from any external phone.